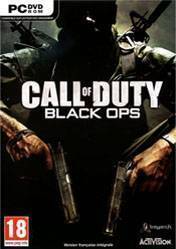 Black Ops is a first-person shooter, retaining the same gameplay mechanics as previous Call of Duty titles. The player assumes the role of a foot soldier who can wield various firearms (only two of which can be carried at once), throwgrenades and other explosives, and use other equipment as weapons. A player close enough to an enemy can kill with one knife blow. A character can take three stances: standing, crouching or prone. Each affects rate of movement, accuracy, and stealth. The player can drop to the prone stance from the standing stance while running, and can momentarily sprint before having to stop. The screen glows red to indicate damage to a player's health, which regenerates over time. When the character is within the blast radius of a live grenade, an on-screen marker indicates where it is in relation to the player, helping the player to move away or to throw it back. Among the weapons new to the series in Black Opsare crossbows with bolts and explosive ammunition, Dragon's Breath rounds and ballistic knives. Multiplayer is very good however it can run poorly on some systems. Also I recommend you use the Repz mod if you want to have better modded servers like COD4 had. one of the best COD ever to come out!